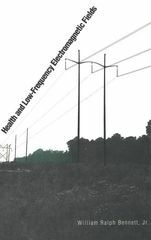 In this book a distinguished physicist evaluates the properties of low-frequency electromagnetic fields and their interactions with the human body and concludes that the health risks from these interactions have been vastly overstated. Bennett reviews the epidemiological evidence for a link between low-frequency electromagneic fields and cancer. He then reviews the basic properties of these fields, outlining the simple methods for calculating and measuring them and illustrating his discussion with original data on the electromagnetic fields produced by common sources. He considers the specific ways by which electric and magnetic fields couple to the body; compares these fields with others of much greater magnitude that must exist inside the body because of thermodynamic processes; and analyzes several resonance mechanisms that have been proposed to explain unusual sensitivity of biological tissue to low-frequency oscillation fields. A glossary and numerous tables and figures accompany the text.